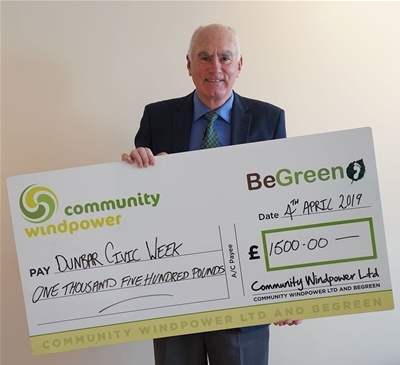 The Dunbar Civic week is all about the community that's why here at BeGreen Dunbar and "Community" Windpower we are delighted to be supporting this years event. The fantastic donation of £1500 will be spent on providing the facilities that will allow for the Crowning of the Civic Week Queen and organisation of the Fun Day that follows, enabling a fun, free day out for all. Diane Wood, Community Benefits Director is pleased to be helping out again this year. "It's events like this one that we love to help out and be involved with. Dunbar has a great community feel and it's great to know that we have helped out to keep the local tradition alive. We hope everyone has a fun day out!" The Civic Week Committee said, "A big thank you for supporting Dunbar Civic Week 2019. We're delighted to receive this award when local Councils are scaling back grants for Gala Days. This will help with the costs involved in arranging the Parade, Fun Day & Week long program of events starting on 15th June." Photograph shows George Robertson, Chair of Dunbar Community Council.